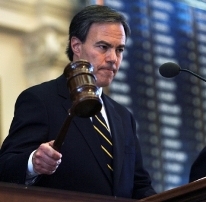 Texas House Speaker Joe Straus Passes New Voter ID Law with Help from Hispanic Caucus. Under the leadership of Texas House Speaker Joe Straus, the Texas Legislature has passed a new Voter ID Bill in both houses. After a long week of delays from House Democrats including over 70 amendments and six more points of order on Wednesday attempting to slow down the bill. The House eventually voted 101-48 to pass the bill. This legislation has been demanded by the voters of Texas for several years but has been blocked repeatedly by Democrats. In 2007 the House passed a Voter ID bill but the Senate could not. In 2009 the Senate passed a bill but the House could not because of Democrat stalling tactics. Now, with the support of the 30 member Republican Hispanic Caucus and leadership from the LNRC TX, (Latino National Republican Coalition of Texas) it is passed. The bill now goes to Texas Governor Rick Perry where it will most likely be signed into law. Because the bill was passed with a 2/3rd majority, it will become the law of Texas immediately. Rep. Allen Fletcher (R-NW Harris County) told me tonight, "This was a fascinating process. We debated 11 hours and saw a lot of ammendments. But more surprisingly were some comments from Democrat legislators, people who are supposed to be our friends and collegues, who came to the mike and called us racists for wanting to begin the process of securing our voting process." Fletcher continued, "Things changed a little bit when some of the Hispanic Republican Legislators stepped to the mike and spoke of things they had witnessed in Democrat precincts in the past." This bill certainly is not a be all and end all when it comes to voter fraud and its prevention, but it is a good first step. Now, let's do something about mail in ballot fraud and removing dead people and people who have moved out of the county from voter rolls. Elections mean things and this bill is proof that a Conservative Legislature can get things done. Good Job! At last! Progress despite the party of obstruction on the left. It's no surprise Dems played the race card, it's a standard and to be expected.